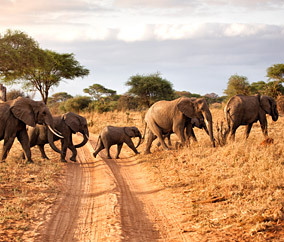 Keep your binoculars handy for Tauck Bridges' amazing family Africa tour... a safari adventure unlike any other. Wake up to views of Mt. Kilimanjaro from your African lodge. Then see who lives on the slopes of this mighty mountain. Is that a set from a Tarzan movie, or the real life home of Maasai warriors and Africa's Big Five? Get a true taste of daily life in the African bush when you learn how to make beaded jewelry and throw a spear, and go inside a village school. See those big cats resting under those enormous baobab trees or that wildebeest making its way past herds of elephants and gazelles. Safely aboard our open-top Africa safari vehicles, everyone has a great view of Tanzania's amazing wildlife during morning and afternoon game drives. And from your tented camp in "the place where life began".... to your lodge next to Africa's "Garden of Eden"... to your safari camp in the western Serengeti, your family becomes part of the unbelievable wilderness pageant that comes alive right outside your door!